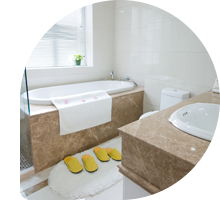 When trying to clear a clogged bathtub drain, place a heavy cloth in the bottom of the bathtub so your shoe soles won't scratch the bath's enameled surface. Hold your hand or rag over the waste and overflow plate, cup the plunger over the drain and plunge it vigorously several times. If it doesn't open easily, the drain may require cabling to open it. Heavy steel spring coils should not be used to clean traps under sinks and bathtubs. A more flexible type of wire or spring should be used—one which is easy to work through the bend of the trap.